Axis Bank recently launched a couple of credit cards after the launch of Vistara co-branded credit cards. Its good to see Axis coming up with new cards after a very long time. They were running credit card business on the pretty old portfolio since past 4 yrs or so with no competitive cards in market. Axis Bank SELECT Credit Card is a Visa Signature Variant and it appears that its free for Axis Burgundy customers (AQB: 10 Lakhs), however, am unsure if they’re also issuing to others with some Joining Fee. You get 6 Complimentary Visits per Year through Priority Pass Lounge programme. For a long time i’ve been waiting to see competitors to HDFC for issuing Priority Pass based lounge access and here we go. PP Lounge Access serves good for international lounge Access, while you can use the credit card directly for domestic lounge access, courtesy Visa Lounges. Axis Bank’s eDGE Loyalty Reward point system has evolved a lot in recent times that its in par and above HDFC reward system that comes with cards like regalia. I never see it as a reason to choose a card, but i see good numbers above. Though I’ve to figure out what this purchase protection actually mean by. Fuel Surcharge Waiver: 2.5% fuel surcharge waived off on fuel transactions of maximum Rs. 4,000 at any fuel outlet. Complementary Airport lounge access: Yes, 2 per Quarter via Visa Lounges & 6 Visits per yr via Priority Pass Programme. Other Features: 3 complimentary Golf rounds per year. Additionally, 1 extra round of Golf per every Rs 1 Lac spent in a card-setup year. Better insurance cover. Taj Epicure Membership. Overall, i see it a good competitor for HDFC Regalia Credit Card which is a premium credit card for ages except that Axis is not concentrating on Forex Markup fee. However, i did notice that Axis Bank Burgundy debit cards has a super cool 0.035% (now 3.5%) Markup fee which is pretty close to 0% markup fee with Indusind Signature Exclusive Debit Card. What do you think about the new Axis Bank SELECT Credit Card? Share your views in comments below. 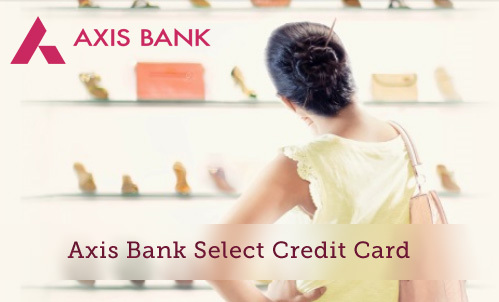 Which one is better Axis Select credit card or Axis reserve credit card? The Axis Reserve is the most premium offering by Axis Bank. From where are you able to confirm 0.035% foreign exchange markup fee for Axis Bank Burgundy debit cards ? In website it says 3.5%. Download their Burgundy Doc. Its there. which is better in comparison, Axis bank Signature or Select. If you get Select card for free, ofcourse its the better one. Select Signature card is better than everyone. Any reader has idea if this is only for Axis Bank customers or even non-axis bank customers can get this card? The main reason I am planning to shift to axis bank is because SBIcard refuses to increase my limit even after showing evidence that I’m earning enough to cover it and keep maxing out the card. In ur opinion, which of the above two would be better for reward points? SBI Elite is good upto certain milestone spend, beyond which you can route the spend on Select Card. Axis Bank today is refusing that they even have a product called Axis Bank Select. The branches are not aware and if you request for a call back online, the lead is given for Vistara Credit Card. Anyone facing the same issue? Maybe its only for Burgundy customers. I managed to get this card under lifetime free despite not being a Burgundy customer. I have a priority salary Account with Axis since almost 5 years and had a Axis visa signature card since 2013. The card doesn’t seem to have too many unique features – in fact the Axis visa signature card used to refund 25% of movie expenses including food and beverage purchases as a cash back. This card doesn’t have that feature and has even recently discontinued Taj Epicure. If you can get a Yes First exclusive card then Priority pass lounge access as a reason to take this card vanishes. I don’t see this card being a game changer for Axis. That’s interesting to know that Axis gives this card for free for non-burgundy customers too. Yes, its not a great card compared to hdfc/yesbank but it does have Priority Pass free visits due to which it can be called one of the best among Axis cards for those who need international Lounge access. Please confirm if the Priority pass membership is valid only for primary card holder ? Or, add on card holder also can use it. Priority pass membership is valid only for primary card holder and there is also a hidden charges. Axis credit cards via edge rewards have a 20x partner (Suraj Diamonds) and quite a few 10x partners (Savaari, Wandertrails, Cheapticket, Urban clap, Condé Naste, GQ, Ad). I now see treebo is a recent 10x addition. Some of them have monthly earning limits, some don’t. Edge rewards bonus RPs aren’t as valuable as others, but useful nonetheless. Points are credited within 15 days as per TnC. Wasnt sure if this was brought up ever on your pages… hence this update. Yes, i’ve been checking on it a while back but the limits and the point value makes it nowhere near to the other offers around. Btw, Surat Diamonds seems to be interesting, but i doubt about this brand’s credibility due to recent happenings in the industry with Gitanjali Gems. 6 complimentary lounge visits at International airports through Priority Pass (Primary cardholder only). Unlock 6 additional visits on spending Rs. 3 lakhs annually. Thanks for this Update. Unlocking additional visits on spends is a nice deal. But again, welcome benefit is pretty low on paid variant! I am an Axis Bank Burgundy Customer.I am a Seafarer So I have Axis NRI Account.I have no loan or credit history.As I haven’t ever taken loan or have any credit card.Can I get the Axis Select credit card? Thanks for this info. Whats the most premium card offered by Axis bank .Is it Axis Select ? It’s axis reserve. It has some great benefits but there is no signup fee waiver and also no annual fee waiver condition. Hi Siddarth, so according to you Axis select is not a great Credit Card. 2. 6 international PP lounge visits are complimentary and 6 additional visits can be unlocked if a 3L annual spend has been made. For a former SPG and current Marriott elite member, its a definite must in my extremely humble opinion. For those who aren’t, its an opportunity to become one with better pricing I suppose owing to the Club Marriott discounts. I would kind of imagine this to be a strong contender to the Super Premium Credit Card list made by Siddharth earlier. Me and my wife both are Axis Burgundy Customers. Both have Burgundy Wealth Debit cards (Master) which allow complimentary Domestic Lounge visits. But no PP Membership or access to International Lounges. I understand Axis Select CC is free (both joining and Annual Fee) for Burgundy Customers. Should we apply / get Axis Select CC just because it is free for us and we can use complimentary International Lounges access during our travels abroad through PP Membership? Burgundy Wealth account allows adding 3 Family members under Family Banking. My son and daughter have no Axis Bank accounts. I am planning to open basic Savings Bank accounts for them and then add them under my Burgundy Family Banking which will enable them to get Burgundy Account Status as well as Burgundy World Debit Card (Master). Next logical step would be to get Axis Select CC for them on the strength of their Burgundy account. Since I as a Primary member is already meeting Burgundy MAB requirements, they can have zero balance Burgundy account as well as life time free Axis Select CC. Is it possible? I tried to check with Axis Bank but got confusing answer. I am looking forward to get this card but have a question regarding Renewal of Club Mariott Membership and Priority Pass. I have heard that renewal is only possible when you spend 3 Lakhs in preceding card membership year. Is that true? If so, it would be deal breaker for me. You need to open Burgundy account only ( with 5 lkh min ) for all the members and not any normal account if you want PP, individual Marriot membership. Later you can combine all of them under one family code and maintain MAB for the family account. My concern was regarding spends of 3L from next year onwards and not about MAB.